Many emergency departments are experiencing very high numbers of patients presenting at hospital. HEALTH MINISTER SIMON Harris has announced a series of new measures to ease pressure on hospital Emergency Departments, including using private hospital beds for patients. Speaking today after he met with members of the Emergency Department Taskforce over the ongoing trolley crisis at hospitals across the country, Harris said that efforts were being made to improve the situation. With Ireland currently experiencing the “flu season”, many emergency departments are experiencing very high numbers of patients presenting at hospital. A record high of 677 patients were on trolleys in hospitals across the country last Wednesday. The numbers have gone down since then, but Emergency Departments are still subject to a lot of overcrowding. Figures from the Irish Nurses and Midwives Organisation (INMO) show that there were 555 patients on trolleys today. The government has come in for strong criticism from doctors people working on the frontline over the crisis since the start of the year. “The bottom line is that the system nationwide does not quite have the capacity to deal with the demands placed upon it,” consultant gastroenterologist Dr Anthony O’Connor wrote in TheJournal.ie last week. Harris said today that it was “unacceptable that patients are experiencing very difficult conditions in our EDs”. However, we are beginning to see an impact from the exceptional measures being undertaken and the intense efforts of all our staff across the health service at this time. He said his department wanted to focus on “making sure we have plans in place to fix the situation in our emergency departments and break the cycle of overcrowding in the health service”. Email “Private hospital beds to be used to ease Emergency Department overcrowding”. 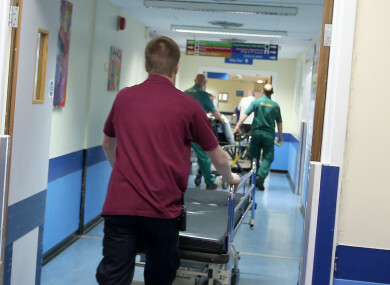 Feedback on “Private hospital beds to be used to ease Emergency Department overcrowding”.